There is an interesting discussion on the old Rule 5 Political Style thread. It’s that conversation — along with other recently seen material — which leads to this article. I read an article years ago, written by a bleeding-heart Liberal. Parents were forcing their kids against their will to eat peas and carrots and all sorts of horrible things like that. The parents were horrible parents for that. Because the parents were lording it over the kids, proving who’s more powerful, not caring about the kids, just being all-around child-abusing bullies. Yeah, okay. That’s straight out of the 1960s counter-culture revolution of the depraved. Remember, Liberals, never trust anyone over 30, mmkay? When I was raising my daughter, I was much more strict than her friends’ parents. But at the same time, I gave her guidelines where she would have room to make her own informed decisions. You can read about some of that in my 2009 Raise Up A Child article. As she was growing up, she saw how her friends acted and how other children she didn’t know acted. And she saw how the parents reacted (or didn’t react). She knew at her young pre-teen age that she was glad for my discipline and guidance, just by watching “everyone else” around her. Of course, she didn’t tell me at the time because, as she told me years later, she didn’t want to encourage even more out of me. Then there’s the Achievement v Handout aspect and the character traits that are built thereupon. Reading my Raise Up A Child article, you will find my daughter had many achievements and much overall success. And the inner reward from that is strong. Reading from the comments in the Rule 5 article, you will find handout-based behavior. And the resultant fits of fury are to be fully expected (that is if you’re a Conservative; Liberals, on the other hand, are totally flummoxed). A life filled with receiving handouts turns into a life with an entitlement mentality. If the person doesn’t actually get what the person didn’t earn himself, the person flies off the handle or gets whiny. He’s entitled to the things you give him for free, despite the fact he never earned it. The other person, the person who doesn’t get hand-outs, that person is happy for what he has because he knows what he has is earned. It was through his effort that he received it, not by some charity mentality hand-out. Via Hot Air, Bill Whittle provides a video showing more “entitlement” mentality and rage against the people who have more. UPDATE: Via Patterico’s Pontifications, more evidence of the evil and depraved entitlement mentality that is the monster the Left has created. The government cannot tax away the deficit spending. It’s an impossibility. RUSH: We’re into statistics today and the unemployment statistics are just fascinating in the way that we’re being spun. It’s as bad as the way we were spun on this debt deal, and the more you look at this debt deal, what a disaster that is. I’m gonna explain why as the program unfolds. This is from the UK Daily Mail. You’re not gonna see this in the American media. Speaking of the American media, remember all of those years, the Bush years, the media apparatchiks on TV were trying to talk down the economy and trying to talk down the market. They did everything they could to talk down the economy. Why, it was almost as though they wanted Bush to fail. Shazam, it was almost as though they wanted Bush to fail. You remember. For four years running at 4.7% unemployment, at 5% unemployment, at 5.6% unemployment, they were proclaiming we were either on the verge of a recession or were in one. They were out trying to find the worst sob stories. Now they’re doing everything they can to talk it up. Do they really think we’re such fools that we don’t see this? When unemployment started spiraling upward, what did we get from ’em? We got stories on how wonderful that is. Families are finding one another again, friends have social time, the stress and strain of working is no longer a part of anybody’s day. It really is a new perspective on life. All the wonderful aspects of not having a job, all the great things you could do if you didn’t have any work you had to do. “Funemployment,” they called it. And now they’re doing everything they can, they’re just incapable of telling us the truth, totally incapable. The question here is who will tank first? Right now it looks like we’re in a race to see whether the country or Obama will tank first. It looks like it’s running neck and neck here. And the trick here is to make Obama tank first. Now, this UK Daily Mail story that you will not see in the US media. “Soak the rich, eh? They do not have the money. A report from the Internal Revenue Service found that the rich –” and the rich are defined this way: 8,274 people with incomes of $10 million per year or more. What do you think those 8,274 people earned combined in 2009? Snerdley, take a wild guess. All of you out there, take a wild guess in your mind. I’m not asking you to call and I’m gonna tell you what the number is here in just a second. But just think about this, 8,274 people with incomes of $10 million per year or more. Now, you got Buffett in there and Gates at their $40 to 50 billion, but that’s their net worth. What do they earn? It’s a different number. But you take all of those people, just give me a number, what do you think, 8,274 people with incomes of $10 million per year or more, what was the combined total income earned of all those 8,274 people in 2009? One trillion, $250 billion. That’s what you say, Brian? Snerdley says a trillion. The answer is $240 billion. Brian, you were $10 billion off. That’s it. That’s right. That’s it. 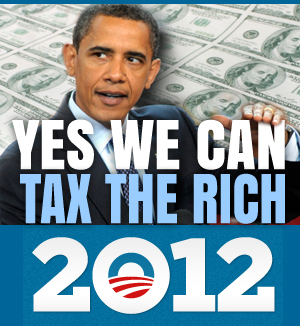 The 8,274 people with incomes of $10 million per year or more earned a total of $240 billion in 2009. “Another 227,000 people earned $1 million or more in 2009. Millionaires averaged taxes of 24.4% of their income — up from 23.1% in 2008.” Now, you might be asking, how did that happen? Well, the Bush tax cuts, folks. Obama’s tax increases hadn’t started, and Obama’s not immaculated yet. “They, too, did not earn enough money to come anywhere close to covering the annual deficits that are $1.5 trillion a year.” So 8,274 people who earn $10 million per year or more, earn a total of $240 billion in 2009. Another 227,000 people earned a million dollars or more in 2009. But it doesn’t come anywhere close to covering the deficit of $1.5 trillion. “Barack Obama was the first president to sign a budget with a $1 trillion deficit into law. In fact, all the taxpayers — including the ones who get a refund check bigger than the withholding taxes they paid — have the money.” The point of this is next time you hear Obama or a Democrat say we’ve got to raise taxes on the rich, it’s not about getting revenue to run the government because they don’t have the money. Now, I’ve been doing this show for 23 years, and I have been employing this data, whatever the accurate data was for the year I was disclosing it, it hasn’t changed in terms of percentages. Confiscate every dollar earned by people who make $10 million a year or more and you run the country for barely over two weeks. That has not changed since I first heard of this statistic 23, 25 years ago. It hasn’t changed. As it is, these people are already paying 70% of the total income tax burden! So there’s no economic growth hidden away here in a tax increase on these people. Individual tax collections equaled 15.4% of all income. “Doubling federal income taxes for everyone would still leave us $400 billion or so shy of balancing the budget.” That’s the bottom line. Doubling federal income taxes for everybody would raise $1.1 trillion, $400 billion shy of the deficit. I know these numbers are hard to follow, but all this is gonna be on RushLimbaugh.com later today, and I suggest you go there, print it out, or e-mail it, make electronic copies, PDF, whatever you want, and spread this around. This needs to be seen by many people. It’s not going to be in the US media. If the Federal Government doubled everyone’s taxes, that would only be enough to cover roughly three quarters of the Obama/Democrat Deficit Spending. We would still have a 400-billion-dollar-a-year deficit, a historically high figure. And that’s considering a static economic environment. That’s not taking into account the heavy inflation, unemployment, business closings, personal bankruptcies, etc, etc that such a massive tax hike would cause. This is Cloward-Piven stuff, folks. Cloward-Piven. Even in a static environment where doubling income tax rates would double income tax revenue, the Federal Government would have to actually cut 400 billion dollars from its annual budget. In Washington, DC and in the Democrats’, lamestream media’s, Ruling Class Republicans’ language of “reducing the increase in expenditures equals a cut” where a 400 billion dollar “cut” over 10 years is draconian, “kill your momma and your kiddies” extremism, how is the Fed ever expected to make an actual 400 billion dollar real cut for a single year? And we need real, actual cuts of at least 1,200 billion dollars a year, and not just reductions in the rate of growth. 2012 is critical, folks. Getting rid of Obama and 6 Democrat Senators is not enough to save this country. We need to throw the Democrats and the RCRs out, and replace them with true Constitutional Conservative men and women. And we need to hold their feet to the fire. No more “Centrist” Republicans. Our nation cannot afford them. All the “Centrist” Republicans will do is pilot the Ship of State to the scene of the crash a bit more slowly. And the TEA Party is here for a time such as this — that’s why Democrats, lamestream media, RCRs fear and hate and malign the TEA Party.